Are UC officials worried about administrative professionals (APs) voting “yes” for union representation? Apparently. Just as organizing is gearing up, UC President Mark Yudof announced a “merit pool” for non-union-represented faculty and staff, after 4 years of no increases. Yudof said the raises were necessary to keep faculty from leaving for higher-paying institutions and to show staff that they are appreciated. He also noted that employees represented by unions "have received regular pay increases throughout this long-running fiscal crisis" because of negotiated contracts. The announcement came just hours before a committee of UPTE APs met with UCOP’s Human Resources officials to object to the announcement in late July that UC wants to change existing seniority and preferential rehire rights for APs. Learn more about the proposed change here, and join with colleagues to comment on this unilateral change here. Meanwhile, UC officials are resisting a mandate from state controller John Chiang for detailed salary and benefit data to be posted online (no names, just job titles), saying “it would cost $1.5 million in programming and labor costs" to provide the information because UC’s database is “difficult to query.” That mirrors UC’s standard excuse to unions when they ask for such information in bargaining. Other institutions don’t seem to have this problem, as hundreds of government agencies across the state have provided the data to Chiang. In the face of UC students having to pay more in tuition this fall than the state contributes to their education, Sacramento Bee reporter Phillip Reese calculates that a "UC education now costs more than a Sacramento home." The Los Angeles Times reports that, for the first time ever at UC, revenue from tuition will surpass state funding. The Times calls this an historic shift and a defining moment for the future of UC. Imagine what might result from bargaining over health benefits if UC faculty were unionized. The City University of New York faculty union is urging the university "to pump more money into a benefit fund" to avoid severely reducing health benefits for adjunct instructors. "Administrators have taken over US universities" and are rewarding themselves and expanding their ranks, argues political scientist Benjamin Ginsberg in The Scientist. Although his administrators don't look quite like UC's, he hits some nails on their heads. For example, "new deans are cropping up everywhere." Meanwhile, "Just how essential are college presidents?" is a new question being asked at the State University of New York (SUNY) — where the president positions at three schools are being consolidated as a cost-saving measure. In the wake of Republicans’ intransigence to allow even minimal tax increases – which has led to an all-cuts budget, devastating everything from elder care to higher education -- the California Legislature approved a bill that would make internet sales subject to the same sales tax as other businesses. Amazon.com retaliated by severing its ties with affiliates in the state, and is circulating initiative petitions to repeal the law. In response, citizen groups have launched a boycott of Amazon. Forty-five thousand employees on strike at Verizon are heading back to work tomorrow after Verizon agreed to restructure how bargaining will proceed, including a more narrowed focus on the issues with the Communications Workers of America (CWA) and the Electrical Workers (IBEW). 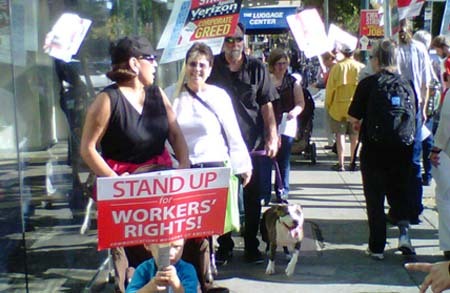 Solidarity pickets of Verizon stores occurred coast-to-coast over the last two weeks, including the UPTE-CWA-sponsored one pictured above in Berkeley last Thursday.